Watch an interesting interview with Mary Nethery. Kirby Larson thinks picture books are one of the hardest genres to write. It took her ten years to write The Magic Kerchief. 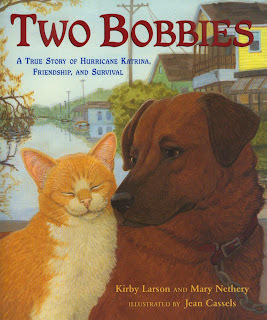 Please visit the official Two Bobbies website to learn more about Bobbi, Bob Cat, Kirby, Mary, and illustrator Jean Cassels. Borrow Two Bobbies from your school or public library. Whenever possible, please support independent bookshops. Requesting this book! Btw, I love that you have a link to Worldcat. Great idea!